We have spent January preparing for this year’s growing season, with volunteers braving the snow to get to Todmorden Unitarian where they got busy checking just how many tools we have and what we needed to replace, then it was all hands to cleaning and sharping to make sure that those we have are in tip top condition. We looked at what work needs to be done to make food to share beds look the very best they can for the groups who come to visit and boost the towns economy and more importantly our whole community who see them every day and want to walk past lush and lovely food to share. Our success at sharing means that some veg beds are harvested as soon the crops are ready, this year we are going to try and replant quickly so that they are never empty for long which means we have the town centre growing looking incredible for the whole season this entailed serious planning by the growing group. We now have a list of seeds needed which will be sewn when the time is right. 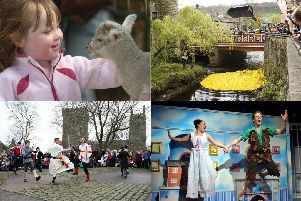 We are also exited at the first two-day Todmorden Folk festival being held on April 17 and 18 with great music and dancing including top folk groups at venues across town, look out for some incredible street food too. It’s going to be a very busy year but our town and community can rise to the occasion.